I don't know who coined this phrase, but I do know it to be a sentiment shared by a select few (around 50 million worldwide) from Argentina to the United States and from the Home Counties of England to its supposed birth place of Iran in the Middle East. "A Game of the Kings and the King of the Games"
This highly skilled, competitive game is a fantastic way to display expert horsemanship and has been adopted by cavalry units around the world. This praxis has been used in the training of elate regiments for centuries. Similar to the Knights of old who needed to have their hands free to fight off opponents, an accomplished polo rider will skillfully steer their mounts through practiced commands using their legs and seat, relying a lot less on the hand than used in other riding disciplines. 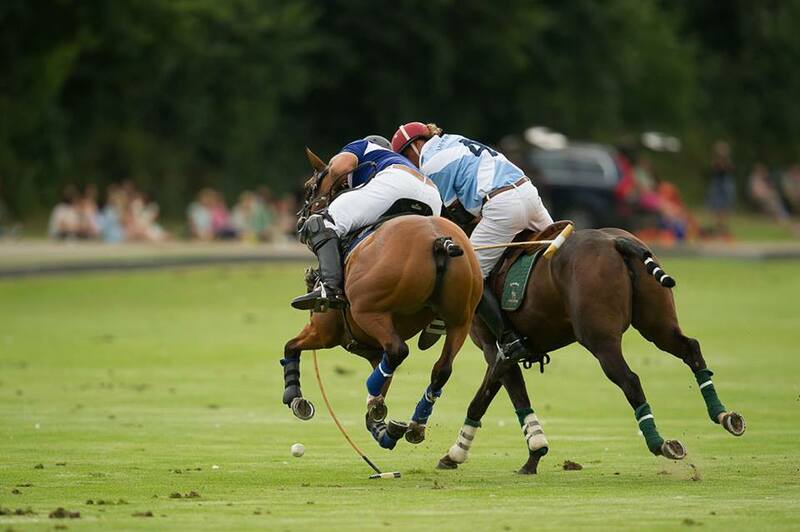 Polo is played on a field of 300 by 160 yards, about two (and a bit) times the size of a rugby pitch. There are 8 people on the field at any one time, four to each side. Each player covers a position on the field the same way one would in a sport like netball. A Polo match is played in 7 minute intervals called Chukkers, in each Chukker a polo pony can cover over 1.5 miles. For this reason any one player will have between 2-6 ponies for one match, depending at the level that they are playing. There are strong similarities in the Rules of the road as in the sailing world. In general, the player to last hit the ball has right on way and any challenge is measured due to the "line of the ball", an imaginary line that passes through the ball in the direction of travel. The objective of the game is to move the ball down the field and score a goal between the posts. It is the beginning of May and that means the Polo season in England in starting again. If you are not quite ready to don your chaps and boots this year it doesn't mean you can't enjoy this splendid sport as a spectator. Ham Polo Club based in Richmond, actively encourages Social Members who wish to support the game. They offer, arguably one of the best social calendars in West London, at least for those you have an interest in Polo, as well as the normal use of the club house facilities and member areas at matches for you and your guests. Match days are a smart casual affair for spectators where picnicking and socialising are normally the most strenuous activity. At half time however you will be encouraged to take part in the divot stomping, taking to the pitch you will help to right the wrongs the horses hoofs have done to the poor field. Although a little more strenuous than politely observing from the side lines, this is a fun activity where you are bound to spark up a conversation with another Stomper. If you would like more information about Polo in London we would recommend you contact Ham Polo club directly and if do decide to investigate this exciting world we look forward to seeing at a match very soon. Are you are looking for an exquisite gift - Do you know where to find the finer places to shop in London? PHS was featured in the TENGOAL Magazine of Guards Polo Club 2016.